Brian Tyler’s high-octane score to Sylvester Stallone’s action adventure. One of the champions of the modern action genre, composer Brian Tyler’s unique sound combines strong themes with orchestral fury and relentless rhythms. Heavily influenced by modern production, Tyler blends orchestral colours with contemporary production elements, shifting between pure orchestra, electronic soundtrack and various combinations of the two. As a rule Tyler uses themes within action cues, which is rare in modern action score writing. This makes his music much more powerful and tense and helps sustain long cues. In the last decade Tyler has created a wide selection of music for many films including Children Of Dune, Constantine, Annapolis, The Fast And The Furious and Aliens Vs Predator - Requiem. Tyler’s previous release on Silva Screen, Rambo (SILCD1260), has been applauded as a fine successor to Jerry Goldsmith’s original music for the series. The Expendables features the biggest action heroes of the last few decades including Bruce Willis, Arnold Schwarzenegger, Mickey Rourke, Jet Li, Dolph Lundgren and Jason Statham. “Sylvester Stallone’s paean to old school, death-drenched action cinema receives a suitably epic orchestral score. 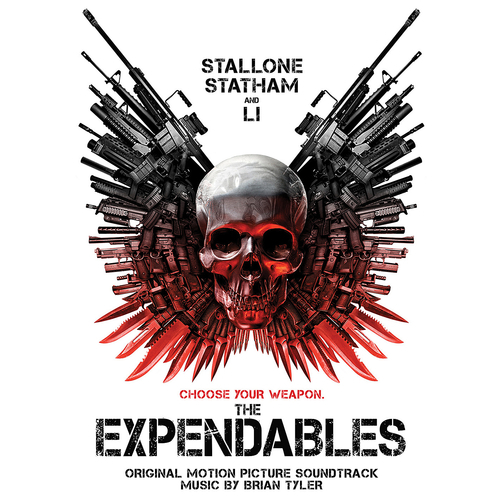 Over 70-plus minutes, Brian Tyler unsleashes some rollicking action work, utilising the full score of his orchestra’s strings, percussion and horn sections on bombastic cues like Massive and Royal Rumble, while the main theme adds a soaring choral section to accentuate the militaristic tone. With an air of amped-up Jerry Goldsmith about it, Tyler has generated an exhilarating example of truly muscular action work”.